In a slight change to the usual format there is no review with this interview. but I’m sure you’ll all find Robin Leigh Morgan intriguing to say the least. Robin hails from NYC and has a husband and two cats.What is one thing that no-one would usually know about you? As far as my writing is concerned, it would be my real name. Almost none of my friends know that I write anything at all. I use a pen name and I don’t hide the fact I do, just look at my blogs or many of the social sites I’m on. It’s not I don’t want to tell them, I don’t want to be bothered by them continuing asking for free copies. I believe many of my fellow authors will know what I’m talking about. The best review my book has received was done by Micki Peluso, who is a professional reviewer and had posted her review of my book and Amazon and GoodReads. Instead of taking up space here, you can read the entire review on Goodreads. As you can tell this individual never bother to look at the intended audience for the book, or even notice the cover for the book. None of the names of any of my characters have any importance to me. They’re merely the most popular names individuals would have for their age. Any author can do the same thing; all that needs to be done is to check with Social Security on their website. When I started to write I Kissed a Ghost, I did a two posts regarding this matter on my website. Selecting a title for a book had been a very challenging experience for me; but after wracking my brain over it, I decided to merely summarize the premise for the entire story in as few words as possible until I had something which could be used as the title for my book. Hence, since the story is about a girl [Mary] and her kissing the ghost [George] she had living in her house, the story had to be called, I Kissed a Ghost. I’d tell them never give up living your dream of becoming a writer, as you can from reading about me, I never did. Before you start looking for a publisher or even an agent you MUST have your manuscript edited, granted the editor you select might miss a few minor points, but at least it’s now in a much more presentable condition. Publishers want manuscript which can be easily edited by their own editing staff, without them having to correct countless misspellings and grammatical errors. Of course I’m jealous of other writers, especially when they’re able to sell tens of thousands of books, simply because their name is________, and especially when they’ve never written anything before. The vast majority of us authors have to struggle to get each copy of their book sold, especially online; as well as being able to get their books onto the shelves of brick and mortar bookstores. To tell the truth the whole story has been one of pure imagination, as I wrote it, I saw different ways of letting the story develop, and chose one which I felt could be built upon. In the beginning I did have a skeleton of an outline for the storyline and nothing more. Think of the Gene Wilder singing Pure Imagination in the movie Willy Wonka and the Chocolate Factory. Without a doubt or any hesitation I’d have to say the Harry Potter series. Hmmm. This is a very intriguing question in trying to get into my psyche. I’d make sure there was no trace of the body whatsoever. I’d start by placing the body in some sort of container containing concentrated hydrochloric acid; it there are any bones remaining, they’d be grind into a fine powder and sprinkle on the lawn of the deceased. Where can you find out more about Robin and buy her book? 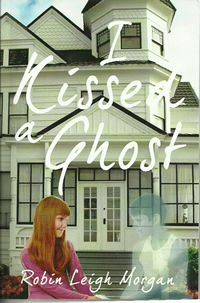 I kissed a Ghost is available in both paperback and Kindle format from Amazon.com and Amazon.co.uk. First THANKS for having me here on the proverbial “hot seat”. It’s been such a long time since you’ve interviewed that I’d forgotten about it. As an update, I’m in the midst of writing my second romance novel; a still untitled Contemporary romance with a paranormal element running through parts of the storyline. As of the other day I’ve written 34 chapters consisting of 234 format pages [single-spaced 6″x9″ pages, like those you find in an actual book] and approximately 68,400 words. I’ve rewritten three of the Five Sentence Fictions [FSF] I’ve done from the prompt words Lillie McFerrin has given on her blog to make them more appropriate for one of the themes of the anthology they’ve been accepted for. And I’ve just submitted a fourth item which is an original FSF, and I’m waiting to her a decision on its status. I’d love to hear from your readers..
You are always very welcome Robin and it’s great news that you’ve been doing so well with all your writing too – do let me know when the new novel is due out. Sure thing Linda. I’d like to invite you and your readers to become one of my followers so you’ll be able to keep up with my progress on my second romance novel, etc.